beneficial than focusing on a single family member. In fact, often times a child will be singled out as the ‘identified patient,’ but once insight is gained into the child’s difficulties, it becomes clear that their problems are actually reflections of broader family problems and painful patterns of relating. Left unaddressed, these painful family patterns tend to cause withdrawal, anxiety, or out of control behaviors. Families can become disconnected or simply coexist in a state of tension. Is my family a candidate for family therapy? While there are no universally agreed-upon signs of family dysfunction, the relationship quiz below may help you identify negative family patterns for which family psychotherapy may be helpful. Family psychotherapy teaches and facilitates communication, connection, and caring within the family. 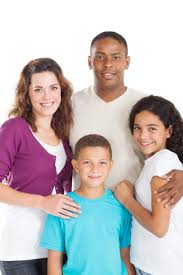 However, this does not necessarily mean that the psychologist will see the entire family together all of the time. Rather, our model involves working within subsystems of the family, meeting with parents, and then meeting separately with children. This therapy structure allows for more full and truthful disclosures of feelings and perceptions, which form the foundation for truth and love, the roots of healthy change. Call our office and schedule an initial evaluation. We will meet with parents first, then the child or children. We will evaluate the family subsystems and coordinate with the parents to develop the treatment plan. This may involve more formal psychological assessments to help the family understand underlying personality characteristics or dynamics that are affecting the family as a whole. Periodically assess progress and adjust the treatment plan as needed until goals are achieved.